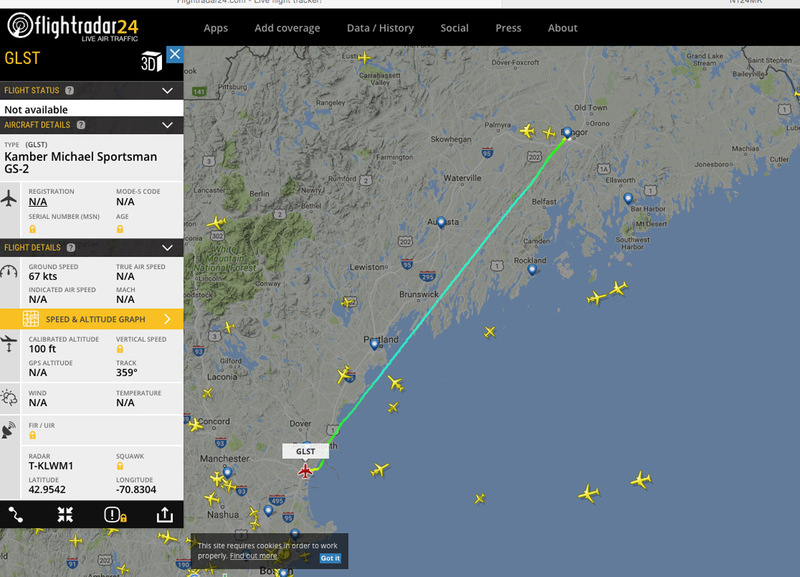 Home GlaStar & Sportsman Ferrying Sportsman N124MK Back to the U.S. 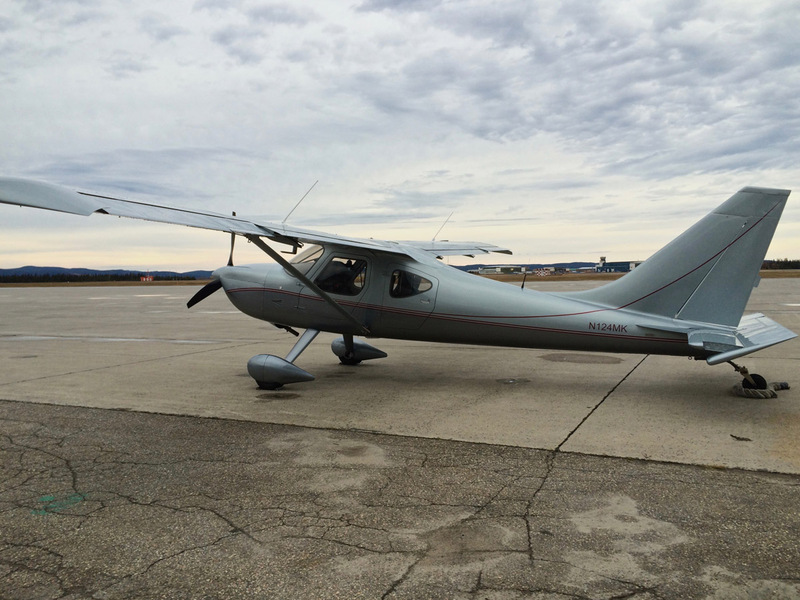 In 2016 Michael Kamber sold his Sportsman to Jeff Franklin, a professional pilot living in North Dakota. The Sportsman was ferried over the North Atlantic—from Switzerland via Scotland, Iceland, Greenland, New Foundland, Maine, to New Hampshire. 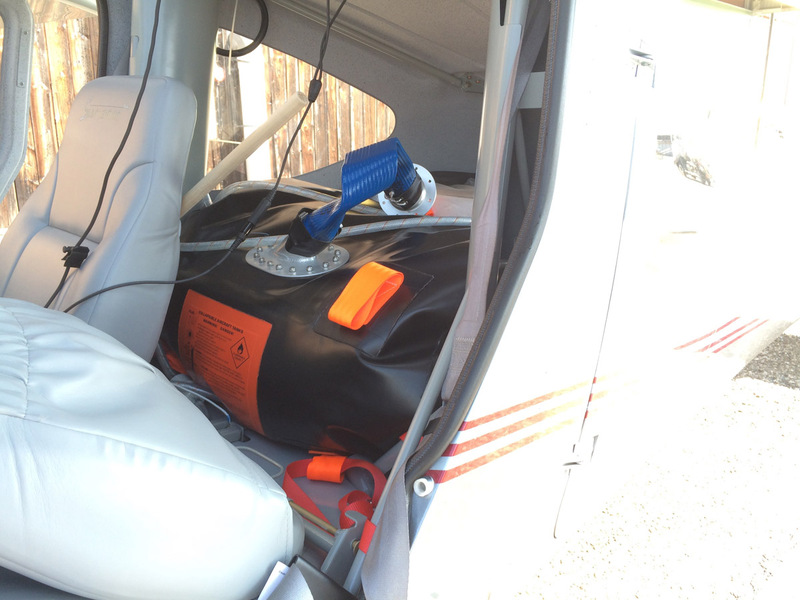 The airplane was fitted with a 66-gallon ferry bladder providing 14-hour endurance. The ferry pilot, Gerald Childers, wrote reports of of each leg. 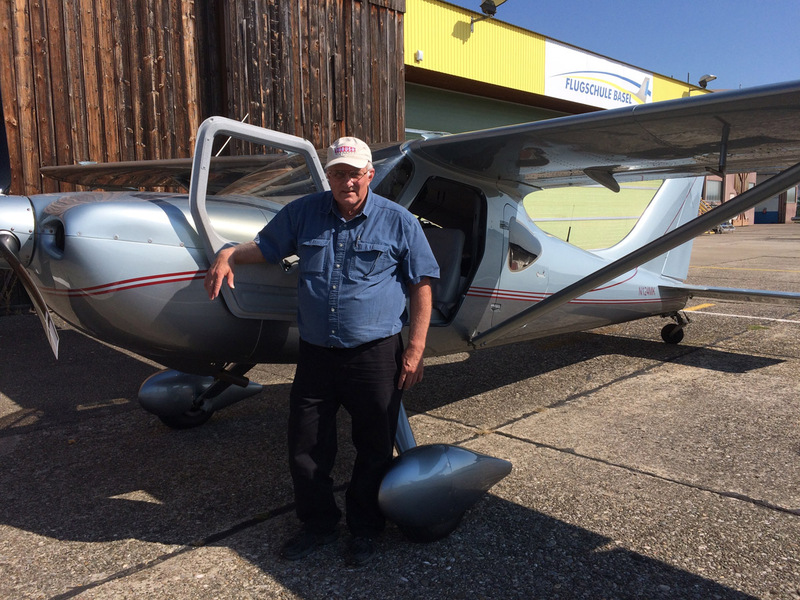 After a quite long, and sometimes difficult prehistory*, Jeff (new owner) and I, Michael (builder) engaged with A2B, a reliable and well experienced ferry company to bring the N124MK, a 2011 Glasair Sportsman from Basel, Switzerland to Portsmouth, New Hampshire. The designated pilot Gerald Childers has more than 26,000 hours of experience, 2,400 hours on tailwheel and more then 300 Atlantic crossings logged! *Perform thorough internet research about your ferry pilot in advance! This will avoid mistakes. After having a 66-gallon Turtlepac ferry bladder installed (which allows a single stop on the southern tip of Greenland or other alternates) in the back and testing its functioning, we were fully ready, including appropriate insurance coverage and the requested permits from the UK, Denmark (for Greenland) and Canada. Customs were informed. Ferry pilot Gerald Childers arrived on Saturday October 24 in Basel and spent an evening with us where he told some interesting stories from his huge ferry experience all over the world. 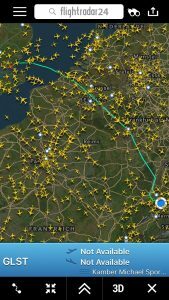 After checking him out on the plane on Sunday morning, he was ready and left Basel for Southend-on-Sea close to London, England on Sunday afternoon. Gerald’s reports follow below and it’s interesting to see, how flexible you have to be. By the end of September the weather is becoming more and more an issue, as the lows are passing farther South. She’s a sweetheart. Good, solid handling in slow flight. Stall warning is a mushiness in the stick rather than any buffet, but the stall itself is mild and straight forward. Michael made a good choice to go to the factory and use their jigs for building the airplane. On landing, if you reach the three-point attitude just as the wheels are about to touch the ground, you’ll get a squeaker. If you’re off an inch, she’ll let you know about it. But then she’ll forgive you, so that’s all right. I don’t have any performance figures—I was busy learning the ins and outs of the electronic displays I thought I had mastered. Homebuilts now have EFIS systems airline pilots wouldn’t have dreamed about a few years ago. And nothing exposes your illusions of competence faster than ATC asking you to provide information you knew you knew how to access, and which you now can’t find anywhere. One thing I figured out early is how to engage the autopilot, and that gave me time to explore all the other menus I thought I knew by heart. 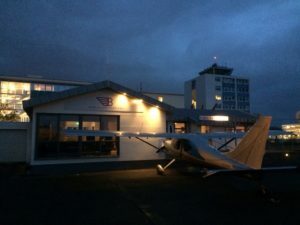 – The #4 cylinder EGT fluctuated throughout most of the flight, both digital and analog, though there was half an hour of encouraging steadiness towards the end of the flight. – Alternator output voltage (“Battery Voltage” with the alternator on line) is a steady 14.6 V, which is at the top of the yellow band. This value only appears if you expand the engine page at least one level, so it might be perfectly normal for this airplane. I don’t see any way to get my trailing-wire antenna out of the airplane without making a hole in it, which I won’t do. I’ve got a good tuner with me, and there are hardware points for pinning the wings when they’re folded that I could use to anchor a fixed antenna, but we’ll probably have to build a stand-off of some sort for the wing top to keep the wire from impinging on the aileron. WetterZentrale’s Niederschlag forecasts still indicate I should be able to run up to Wick ahead of the weather tomorrow. Tuesday looks like it might not be a good day for Iceland, though: rainy weather propelled by a burst of westerlies roaring up from 45° North. After that blows by the chances look fairly good for the subsequent legs. We’ll see. At FL100, full throttle (20.8″ MAP) and 2500 RPM, leaned to, at most, 45°F lean of peak EGT, gave me 61% power and resulted in 120 KTAS at 8 GPH. That’s not bad. If I could be sure of getting every drop of fuel out of the ferry tank it would give me 13-1/2 hours of endurance, with a bit taken off for the climb; With a hint of a tailwind that would get me nonstop from Reykjavik to Goose. That’s something to consider, but not anything to count on. Thursday’s winds are forecast to be mostly confused, with a sweep of crosswinds out of the northwest over the Davis Strait—so, no tailwind, but not much headwind, either. The airplane’s in the hangar, so the only precipitation it’ll be exposed to tomorrow will be from the pigeons. That’s where I’ll spend much of the day, playing with my tools, and trying really hard not to drop a screw into an inaccessible location. N124MK amongst the pigeons at Wick, Scotland.You’ll notice I put the seat cushion and the glare shield under the wing for protection. But I was glad to have the hangar, pigeons and all. The little airplane would have been sadly tossed about today if I’d have parked her outside. Guess what I accomplished today. Give up? I hooked up a wire, that’s what I accomplished. Well, first I found a ground. I looked high and low for bare metal, and found only paint. I finally decided to use the same ground the ferry tank installers used for the ferry fuel pump. In the bottom of my tool bag I found a longer bolt that I swapped with the original, so I could add all my ground wires (HF power, HF chassis, HF antenna) to the fuel pump ground. Then I hooked up the power lead for the HF. The glareshield pops right off in this aircraft, and you can look through the windshield at the back of the circuit breaker panel. It’s all right there, in plain view. It looks so easy! (I wish I’d thought to get a photo.) But in fact the windshield gets in the way when you try to reach around to the screws and bolts, and the airframe structure gets in the way when you try to see what you’re doing. If I watched what I was doing through the windshield, I’d need arms about two feet longer with three more elbows. I know you’ve heard all this before. This is the typical complaint from people working on airplanes. The bit about needing more elbows probably goes back to the Wright brothers. At least you don’t get all greasy, or have dirt falling in your eyes. But in fact this power drop installation was the easiest-looking and the most difficult to accomplish of any I’ve had in twenty-five years of ferrying. When I finished I was exhausted, but very, very pleased I’d been successful. The rest of the HF installation should be more straightforward, and I might be able to finish the job tomorrow afternoon in Iceland. That’s not a prediction—it’s a hope. Maybe it’s a fantasy. We’ll see. I’m not going to check the weather tonight. It is what it is, and I’ll need to check the latest information in the morning anyhow. I’ve just had a nice meal in Wick’s charming little French restaurant, Bord de l’Eau, and I’m just going to go to bed with a happy tummy and get up early in the morning. But what I’ve seen so far suggests a morning departure for Iceland might be a good idea. I had a good flight, on top all the way at FL100 (sometimes just barely), 30-knot headwinds gradually shifting to crosswinds. The Olís avgas pump malfunctioned in the morning, so I had to taxi across to the pump at the T-hangars, and boy, did the little girl attract a crowd of admirers! I’m looking at the weather from here to Goose Bay, and scratching my head. I’m seeing a small low off the east coast of Greenland, which maybe has been moving south but is forecast to settle in just east of Cape Farewell. There’s a medium low down around 50°N that’s forecast to move north-northeast and then northwest to join the small low and form a ferocious storm by midnight Monday morning that’s expected to persist until Tuesday before it starts to fill. I could go to Narsarsuaq tomorrow skimming the top of that small low, but I’m concerned about what weather that might push up onto the ice cap and whether I could get over it in the Glasair. Kulusuk would be available (i.e. open) for an alternate, but it’s likely to be affected the same way. 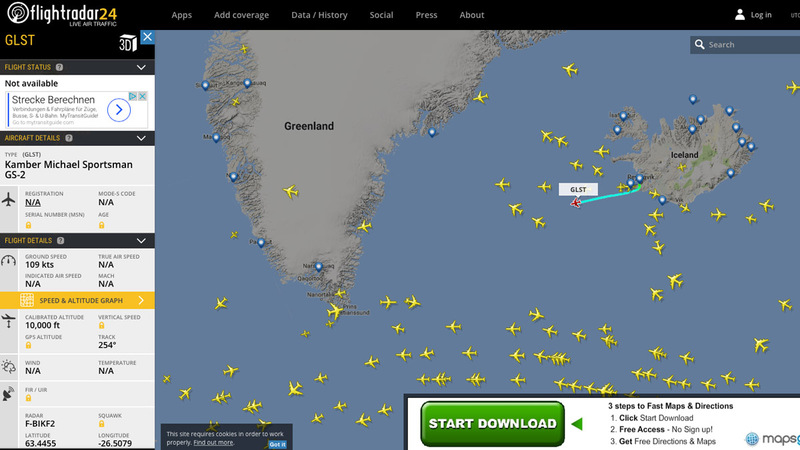 I’m thinking I might want to go non-stop to Søndre Strømfjord and then south to Goose. 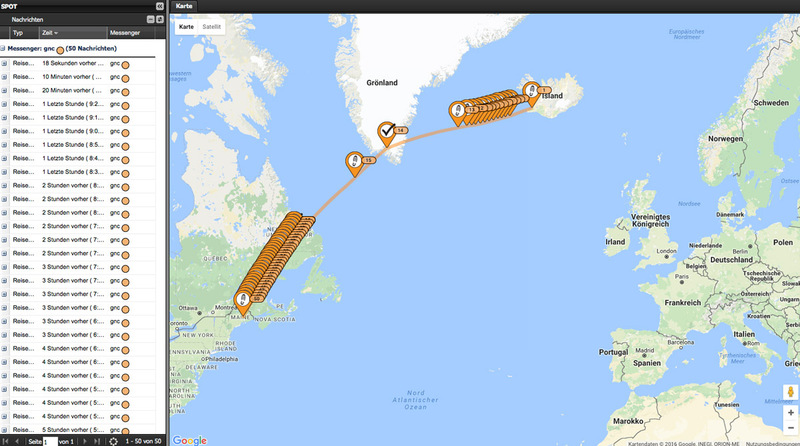 That’s pretty far out of the way, but it beats being stuck here for a week, and it would probably keep me away from the effects of that Cape Farewell low, and then the leg to Goose would have the winds roaring down the Davis Strait somewhat behind the wing. The guy at reception advised me I’d better eat early, because the restaurant here (at Hotel Ódinsvé) is going to fill right up on this Friday night. So I’ll go eat now, and resume my head-scratching after. 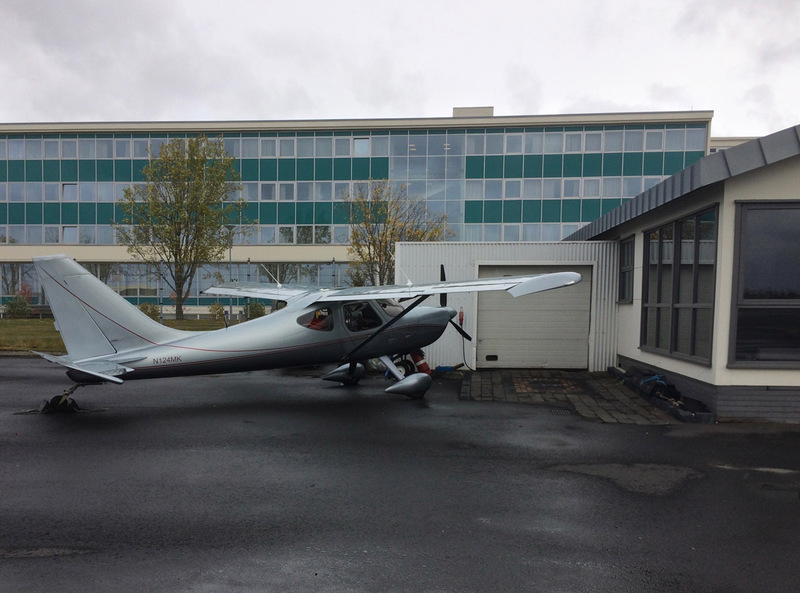 It’s safe to bring the airplane out of the hangar now, but the strong headwinds to Iceland would leave me pushing darkness by the time I arrive, which I don’t want to deal with in this airplane. 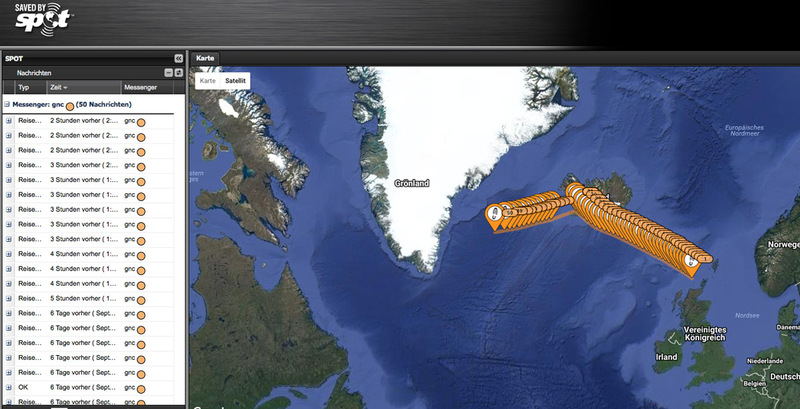 So I’ll leave in the morning, and hope to push through to Goose Bay on Saturday. I recorded some power settings on the way from Wick to Reykjavik. I had to throw the first batch out because the mountain wave off the Highlands interfered with the results, but the second batch was taken about two thirds the way to Reykjavik in the lightest winds of the leg, 10 knots from the southwest (no mountains in that direction!). These were all taken at FL100 and -9°C, density altitude 9,400 feet, full throttle, between 45 and 50 degrees lean of peak on the leanest cylinder, and with about 80 gallons on board plus me and all the equipment. If I were to do this again I’m sure the results would be subtly different, but we can learn some things from this table. Notice how between 2250 and 2200 RPM the power, speed, and fuel flow fall off appreciably. Above 2250 the power does increase with RPM, but not much, and I think the internal friction of the engine reduces the power output at higher RPMs. 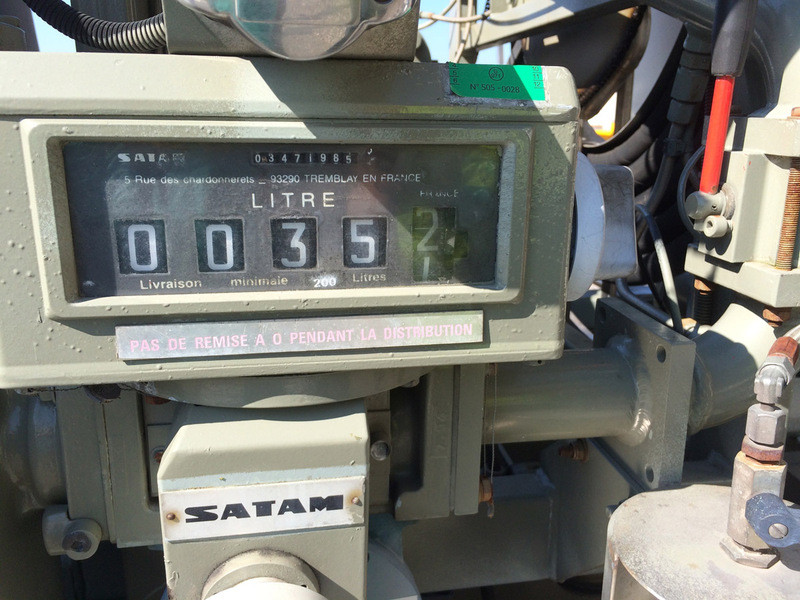 The fuel flow increases steadily, but the airspeed much less. I wouldn’t be surprised to see 124 KTAS at 63% from another run of these power settings in the exact same conditions, but the tale of the table is you don’t get much for your increased half gallon per hour. To me, in still air or tailwinds or even light headwinds, the best deal at high altitudes is full throttle and 2250 RPM. I’ve run power settings tables for turboprops several times, but somehow never did it for normally-aspirated pistons. I think of all those hours I sat there listening to an engine at 2500 RPM, when I could have had a quieter, smoother ride, and been easier on the engine at the same time (no small consideration when it’s all there is between you and the water). Winds tomorrow morning 0900-1200 130 18G28, so I’ve moved the airplane into the lee of the building. I wasn’t counting on that part of the building being a garage for snowplows with a sign prohibiting aircraft parking. I’m sure I could have got permission from the tower since the snow is a few days away this year, but I actually found a better shelter, with the airplane nosed into the angle of the Flugþjónustan building pointing southeast into the expected wind, and with a double barrier of the hotel and tower, and then the smaller building itself. A slow internet: I closed some of the weather-related pages on my computer and re-booted it, to see if that would help. Meantime I went and ate breakfast before they shut it down. What I’m seeing on the (I confess) gramets is an easy flight until the coast, and then the weather around that 1008mb low. That’s not the lows we’ve been dealing with, but I still have trouble with the idea of layers in a low—that air is rising, after all—and the gramets don’t show any (I ran a couple of projections 3 hours apart). The one for a 20Z arrival at Goose shows the cloud mass much reduced, but still 3 to 5 thousand feet thick, with icing throughout. It also shows the air clear below 5,000 feet, but Goose’s TAF predicts no ceiling higher than 2,000. Now, I’m happy flying under a 2,000-foot ceiling over recently wetted ground if there’s an airport every 20 miles I could duck into if the mist starts to rise. But that’s not the case here. I’d go into Gander, which has much better weather, but I need to turn in the life raft at Goose. So what I’m going to do is re-fuel the airplane today and file a flight plan for tomorrow at 08:00 local/1000Z, when the airport opens for the day. The gramet shows clear sailing, with the freezing level rising to 10,000 feet over Labrador, and the projection to Bangor shows good weather and a 10,000-foot freezing level all the way. The headwinds will be ferocious—though not much worse tomorrow afternoon then they’ll be tomorrow morning—and the last hour or two of the flight will be after dark. But a night landing in good weather is a lot different than a night landing in the clag. I’ve received the latest Jepp icing chart, and it looks good. But it still shows that low hanging around Goose Bay like a hoodlum, and the gramet shows the freezing level still low, and, once again, the TAF says OVC020. (The weather here in Greenland is great, altostratus at 11,000′ or so.). So I’ll stick with the overnight here and then Goose/Bangor tomorrow. P.S. With all the information available to us now, and especially with a slow internet, it sure can take a long time to properly study the situation. I don’t think it’s happened today, but I can imagine, as you’re going from chart to chart and evaluating different scenarios, a window of opportunity might open and quietly close again while you’re still scratching your head. This is one reason talking to a (good) briefer can be helpful: he’s already studied the charts, and has the meteorological mise en scène in his mind, so all he has to do is try to fit your various proposals into it, or suggest some that might fit it better. 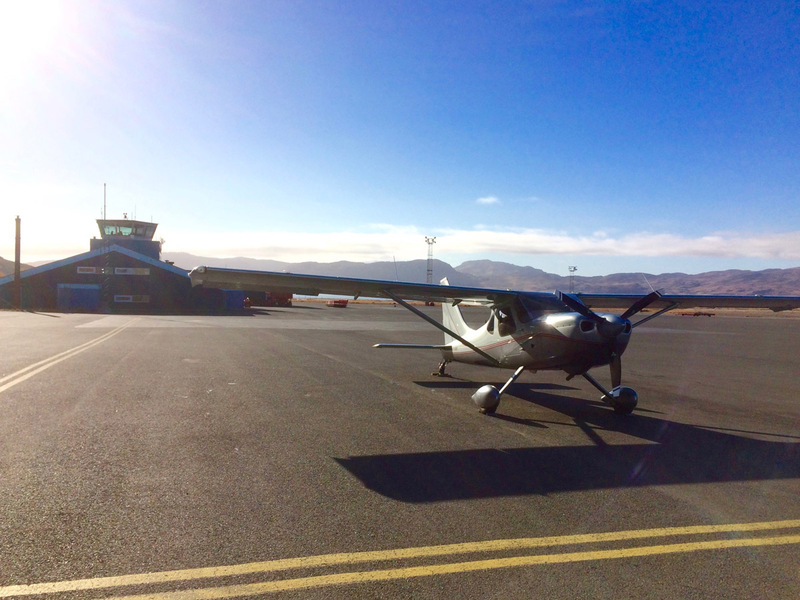 Narsarsuaq has FEW080, and they’ve published a TAF this early in the morning: SCT100. Goose has a ceiling at 2,600′, forecast to be between 3 and 4 thousand, generally rising and layered, until 17Z (about the time of my arrival), when the clouds will be scattered and the winds somewhat gusty at 21015G30KT. That’ll be the passage of a pretty dry warm front, and I’ll be flying down to Bangor just ahead of the cold front into the teeth of the wind. I think I’ll go at 6 thousand feet rather than 10, since part of the time the winds will be lighter down there. The gramets show clear sailing and a high freezing level all the way, and of course, the headwinds. Bangor’s forecasting clear skies throughout the day and—even with 40-knot winds at 5,000’—very light winds on the surface. I expect to arrive there around 0100Z/21:00 tonight. I’ve already filed the eAPIS, and Bangor Customs just wants a phoned-in ETA just before I leave Goose. Hurricane Matthew is expected to curve back south, but WetterZentrale shows its associated precipitation continuing up the coast, gradually moving offshore. We’ll see. It’s a little airplane (and cute, did I mention that? ), but it took some rubbing to make the plane safe for takeoff, and that took some time. I lost some more time playing phone tag with Customs, but I did get that straightened out in the end. And I finally took off two hours later than I had intended. 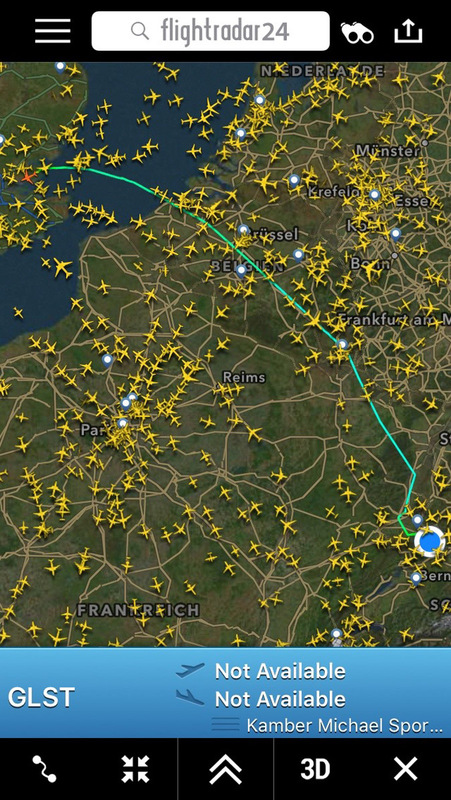 The flight itself was routine, except for the frustration with the HF. I could hear Gander on 8864 as if he were sitting next to me, but he couldn’t hear me. A couple of times he said, “Aircraft calling Gander, say again your call sign.” And, hope springing up in my breast, I would say “November 1 2 4 Mike Kilo,” very slowly and distinctly, and then I would let up on the mic button and hear him answering some other aircraft! Aargh!! At seven or eight feet, that antenna is just too short, but there was no way to let my (200-foot!) trailing wire antenna out of the airplane in flight, and I really don’t think I could have mounted a longer fixed antenna. Anyhow, I’m here, and I haven’t been asked to call ATC and explain why I flew that route with no HF. Before I reached the coastline I flew into some weather. It was mostly snow—I had dim ground contact once I passed the coast—but there were some clouds at FL100, too, and the temperature was below freezing. I let down to 8,000, and then 6,000, where the temperature was +2°C. It gradually rose to +9°C, as the winds backed to the west and increased to 40 knots on the nose, and I was grinding along at 80 knots. And then a marvelous thing happened. The ATIS for 16Z reported a 4,000-foot ceiling with scattered clouds below. The ATIS for 17Z reported scattered clouds, a ceiling of 25,000 feet, and gusty winds—exactly on schedule! I understand a little bit about how forecasts are made, but I’m always amazed then they hit the nail on that little flat spot on top. 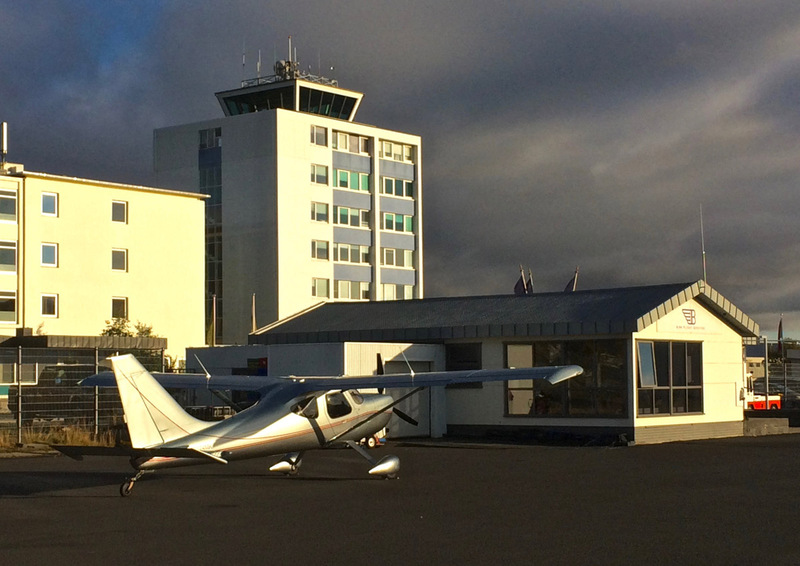 The wind on landing was a 40-degree crosswind gusting to 22 knots. The little lady fussed at me for not making a perfect landing, as she always does, but she didn’t go so far as to dart suicidally for the ditch. I parked her in the lee of some buildings, facing into a wind that quickly faded away to a zephyr. Bangor is forecasting some weather as the cold front passes, then clear after noon. The winds tomorrow are forecast to be less than today at 5,000 feet (though there’s no relief at 10,000). And if I continued to Bangor I’d have landed way too close to midnight for this old fogey. So I’m spending one more night on the road. I made sure that the Spot tracker was oriented correctly today. I started to change batteries this morning, but I found I was out of fresh lithium batteries, and there’s a placard on the device requiring lithium batteries only, so I chickened out. I’m going to try to find some lithium batteries in Goose Bay, and if I can’t I’m going to pretend I’m an Italian and just toss in whatever I have on hand. I never got a red light on the LEDs, but I still think it must be the batteries. I had a good chance to check the accuracy of the gramet forecasts today. They did pretty well. 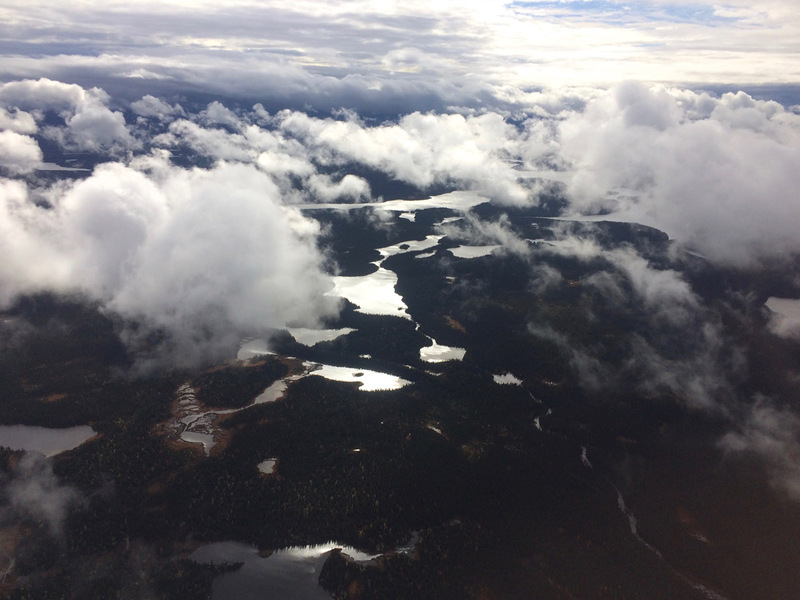 The clouds over Labrador were lower than predicted, but from Quebec south they got it just about right. Bangor had been forecasting a 2,500′ ceiling for the time of my arrival, but that was revised to reflect what the gramet had been predicting all along. The headwind and tailwind components were close, too. But they showed the freezing level rising over New Brunswick to reach 10,000′ at Bangor, and that never happened: I was in plus temps all the way, but at 4,500′ the OAT was +3°C, and I think the freezing level never rose much above 5,000′. Shortly after takeoff I climbed to 4,500′, but I soon had to duck back under at 2,500′ to stay in VMC. But the visibility was superb. I only fly low over Labrador when I have to, but when I have to I always enjoy it. For 200 miles on this route, from near Goose Bay to just north of the St. Lawrence, there is no sign that mankind has ever existed on the earth. You’ll notice the 2,500′ yellow line on the gramet is scraping the hilltops north of the St. Lawrence. At that point the GPS was getting nervous about the terrain, and the beautiful dove-gray leather on the glare shield was reflecting in the windshield, making it hard to see ahead, so I climbed to 2,800′ for a bit of margin, still staying below the worst of the headwinds. I had forgotten to call Bangor Customs with an ETA at Goose, so when I was approaching Havre St. Pierre, on the north shore, I coupled my phone to my headset with Bluetooth, and started checking for a signal. Twenty miles north of town I had two dots/bars of signal strength, and calling them was easy. Ain’t technology wonderful? At the St. Lawrence I climbed to 4,500′, to give myself more time if there was a problem. The sky was wide open at this point, but I had to accept a 10-knot increase in headwind component, to 15-20 knots. Still not nearly as bad as the 50 knots I was facing yesterday. Over New Brunswick I was happy to see the colorful leaves hadn’t all fallen off the trees in my absence. 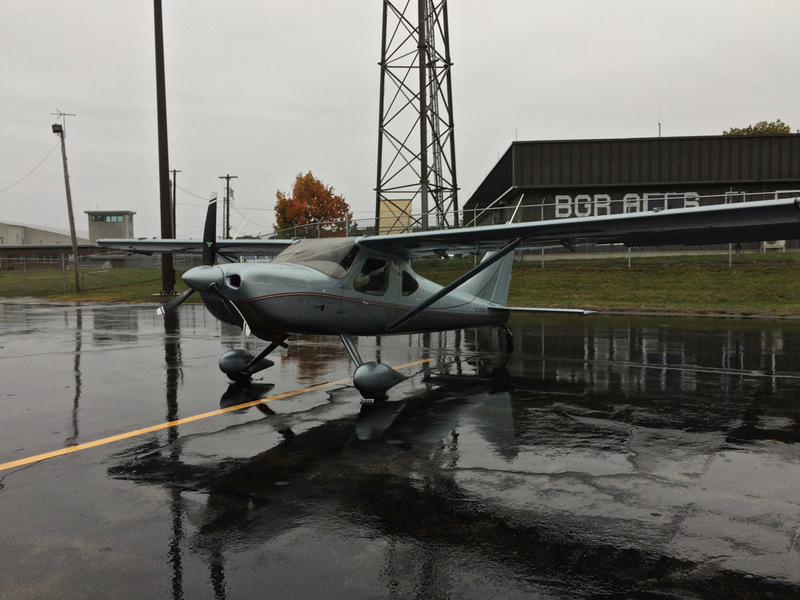 There was moderate rain from Houlton on, so I got an IFR clearance at 4,000′. I was below the ceiling all the way, but visibility was reduced in rain, and it was very comfortable to be IFR. I made a visual approach to Runway 33 at Bangor, taxied to the designated Customs inspection spot for the formalities, then tied the airplane down for the night. I expect to deliver to New Hampshire tomorrow. Jeff and I are coordinating our plans. On the field at Bangor, Maine. 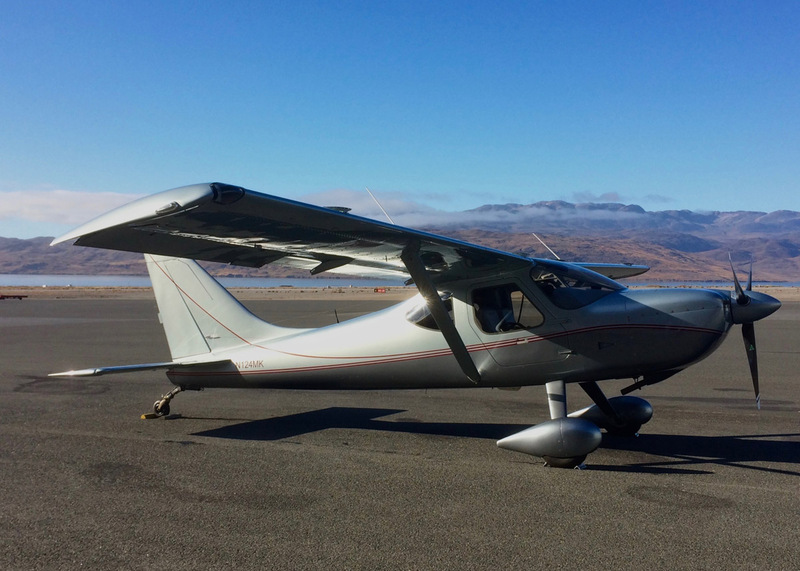 Last Sunday (3/17/19) we were treated to a visit by Jeff Franklin & Therese Bohusch (both are pilots and co-owners) in a rather special aircraft: a Glasair Sportsman GS-2 with 195 HP Aero Sport IO-375 engine. Before they landed, while they practiced cross-wind landings we were attracted to the throaty sound of the engine but no one could identify what it was although we all knew what it wasn’t. We learned that this plane was built taking advantage of the factory two week to taxi program, shipped to Switzerland then ferried back to the states when Jeff & Therese bought it. They kindly offered a ride to everyone who wanted to take a ride – very generous! 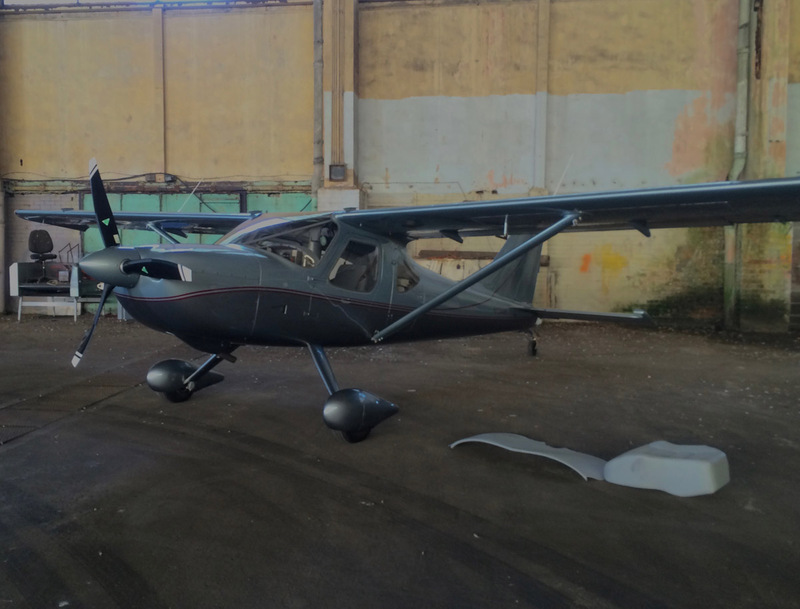 It is a most impressive aircraft, the acceleration pushes you back in the seat, the dual EFIS will convince anyone who sees it and although not an instructor, Jeff explained everything in a clear and concise manner that would make any student comfortable. Thanks for topping off a nice day at the airport, please come back! 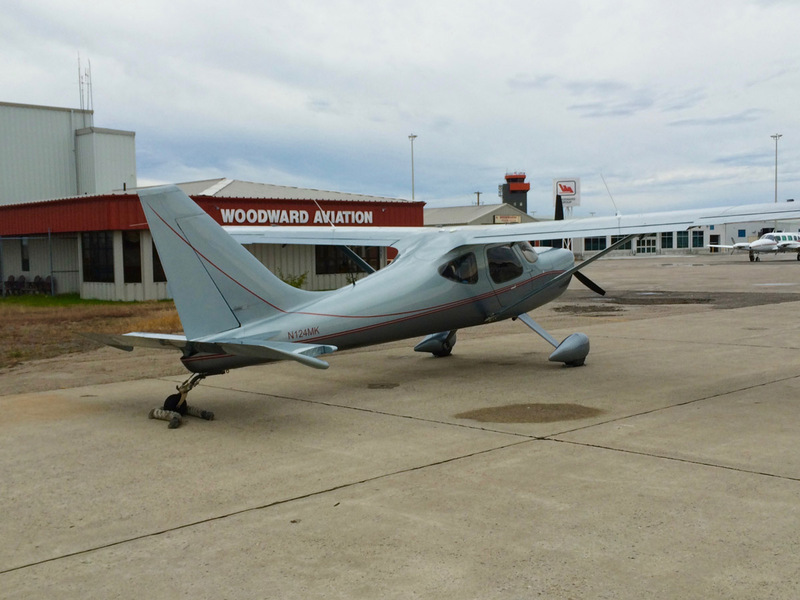 Later, on the The Glasair Aircraft Owners Association Website, we found this very interesting article about the ferry flight.